A Warm Welcome to Mobo2go! Brickweb are proud to introduce Mobo2go, the latest addition to our diverse client base. We have provided a striking website with an array of useful features, offering clear information and instant access to their extensive range of services. Mobo2go provides an ordering system designed for food-to-go retailers, accessible from both desktop and mobile devices. The innovative system allows customers to quickly place a food order using a PC, smartphone or tablet, before providing a secure online payment system. Once payment is approved, the order is sent to the store where it is printed, allowing the chef to prepare the order for either delivery or pick-up by the customer. Improving customer service levels and boosting sales for the retailer, Mobo2go is now used by many restaurants, cafes, takeaways, catering companies and coffee shops. Brickweb have created the Mobo2go website to be responsive, instantly adapting to display perfectly on the device it is accessed from. This is an essential component of m-commerce as customers who have to pan, drag and zoom continually to find information will often give up in frustration and find another goods or services provider. 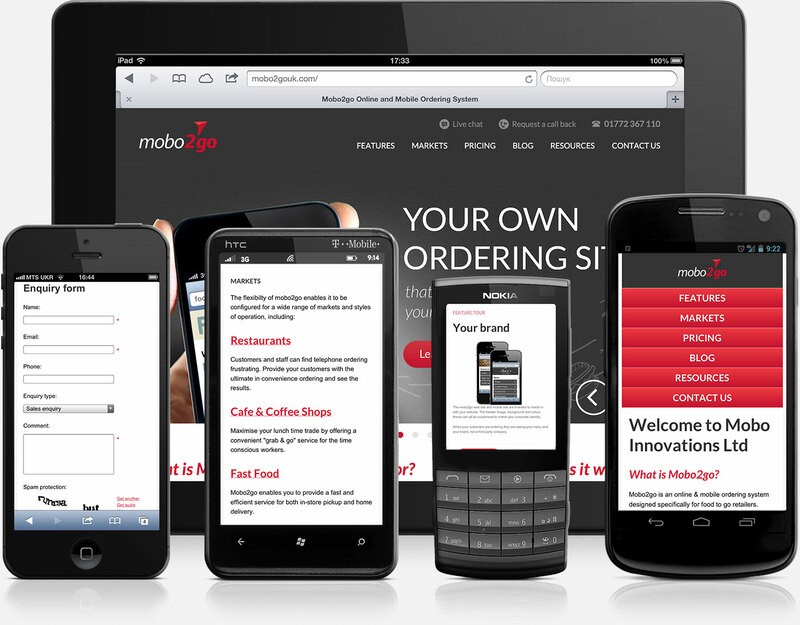 Completely optimised as a mobile website, Mobo2go benefits from a bold and exciting visual design that is at once striking and refined. The company produce a regular blog which can be quickly accessed through the new website designed and custom-built by Brickweb, allowing customers to keep in touch and receive regular updates. Customer service is obviously an incredibly important consideration for any business. Providing customers with a variety of ways to get in touch is essential; along with standard telephone and email facilities, the Mobo2go website offers both live online chat and callback request functions. Please visit the new, Brickweb-designed site at www.­mobo2gouk.­com to see for yourself the incomparable combination of form and function provided by Brickweb desktop and mobile websites. Brickweb offer an extensive range of e-commerce systems and solutions. To book your free consultation with our dedicated and experienced team, please contact us directly on +44 (0)1254 277190 or email info@brickweb.co.uk. BRICK | e-commerce Made for Mobile!